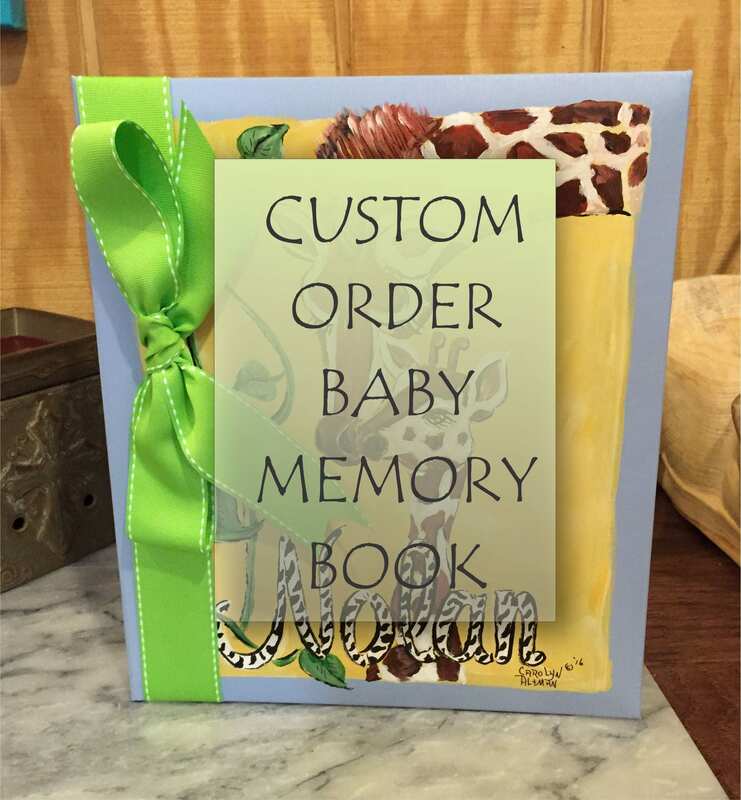 CUSTOM ORDER BABY MEMORY BOOK....give me your idea of what you want for your baby's keepsake book! Even though have a large variety of themes for my baby memory books, as you can see listed in my Etsy store, or my website www.carolynaltmanart.shop. I will gladly accept new ideas! Do you have a special idea for your baby's memory/keepsake book? Send me a contact message on Etsy and let me know what you have in mind. I love your input! For instance, I did this custom cover as requested, let me see if I can do a design for you! These special baby memory books are more that a memory book...each is a work of art to be treasured for many years. The cover can also be personalized with your baby's name at no extra charge. A keepsake scrapbook style book that includes pages inserted into plastic archival sleeves for safe keeping. I print each page in my art studio (also know as "Glory Bee Baby") and carefully inspect each. Please send me a conversation on Etsy with the baby's name, or add to the custom area of the order. These books are sold exclusively by me, Carolyn Altman, artist and owner of Carolyn Altman Art, LLC/Glory Bee Baby on Etsy, and www.GloryBeeBaby.com or www.CarolynAltmanArt.com. Each Baby Book comes with the following pages in the book. They Loved it so much. She does an amazing job on these books, so worth the money. It is a wonderful keep sake for a family. You went above and beyond! I have gotten so many compliments on the baby book! Thank you so much! !